Need a quick and easy way to set up your presentation? 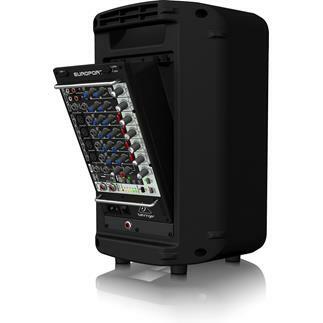 The EPS500MP3 from Behringer is an all-in-one portable PA system that goes nearly anywhere and can fill a mid-size to large room with clear, powerful sound. And if you want to add pre-recorded audio to the mix, its built-in MP3 player lets you reach your audience with your digital files easily. And whether you're in a church or a lecture hall, you can use the system's 8-channel mixer with reverb to make even the most complex presentation sound great. The EPS500MP3 comes fully equipped with a pair of speakers and a detachable mixer, plus a dynamic microphone, a pair of speaker cables, and a power cord. The entire package weighs just over 40 pounds, making it eminently transportable from gig to gig. If you've got a social function where different people might be setting the system up, it's intuitive enough for even the most novice of audio enthusiasts. 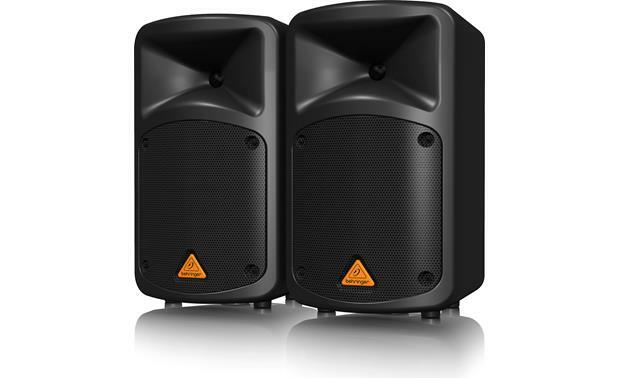 The speakers feature standard mounting pole sockets for placement flexibility. 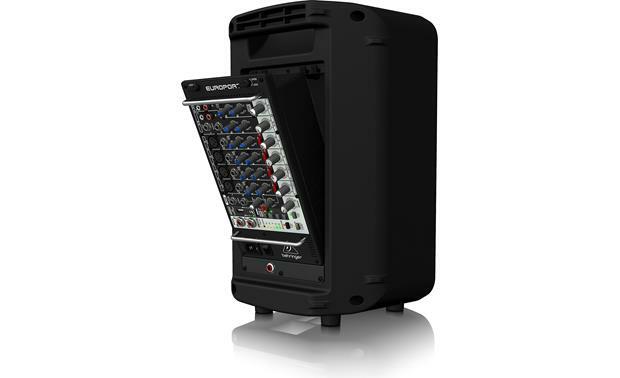 The EPS500MP3's mixer fits comfortably in the rear of one of the system's speakers. The EPS500MP3's 8-channel mixer gives you control over the audio without inducing panic attacks. Channels 1-4 feature Behringer's trademark XENYX mic preamps for clear sound with gusto, while the 2-band EQ (bass and treble) lets you set the tone of your event. You can even program the system to prioritize speaking voices over music, allowing your words to be heard as the music gets relegated to the background. The built-in digital reverb processor lets you add a touch of sweetness to your singing or playing, allowing you to make your performance truly remarkable. And it's so simple to operate, you'll wonder how you got along without it before. The dilemma: you want to add music to your presentation, but you don't want to lug around a portable CD player and connection cables. Just load up a thumb drive with the songs you need, and you can plug them right into the EPS500MP3's built-in USB port. You can manipulate the tracks on your thumb drive with the mixer's 4-button pad with random, play/pause, rewind, and forward controls. Behringer's custom-designed speakers feature 8" woofers and 1" compression tweeters, for distortion-free, ear-friendly sound at just about any volume. And with 500 watts at your disposal, you can take your party, wedding, or karaoke night to the limit. With the 48-volt phantom power on hand, you can even add condenser mics to the system. The EPS500MP3 boasts 4 XLR connections for microphones, plus the same number of balanced and unbalanced 1/4" line-level inputs for electronic keyboards and other sources. You also get 2 pairs of RCA and 1/4" inputs on channels 5/6 and 7/8, allowing you to plug in the entire band without worry. The system's also compatible with Behringer's ULM Series wireless microphones, for those times when you want to perform untethered. 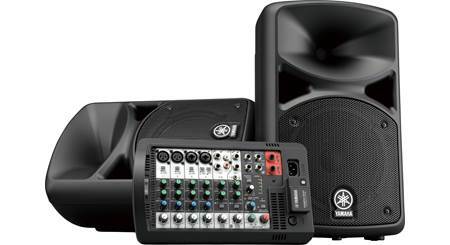 Portable PA System: The Behringer EPS500MP3 Portable PA System consists of a pair of two-way loudspeakers and a detachable powered mixer. 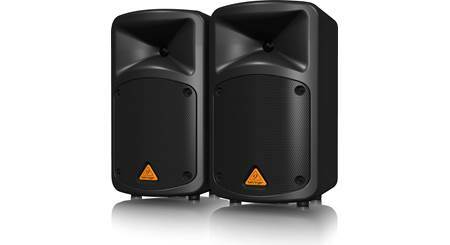 Two-Way Loudspeakers: The two satellite loudspeakers, each with a custom-designed 8" woofer and 1" compression driver, provide the rich sonic performance you would expect from a much larger system. The EPS500MP3's powerful 8'' woofers and 1'' compression transducers crank out rock-solid low end, with articulate, detailed mids and crystal-clear highs. Detachable Power Mixer: The Behringer EPS500MP3 features a 500-watt stereo amplifier built into the PA system's detachable powered mixer. 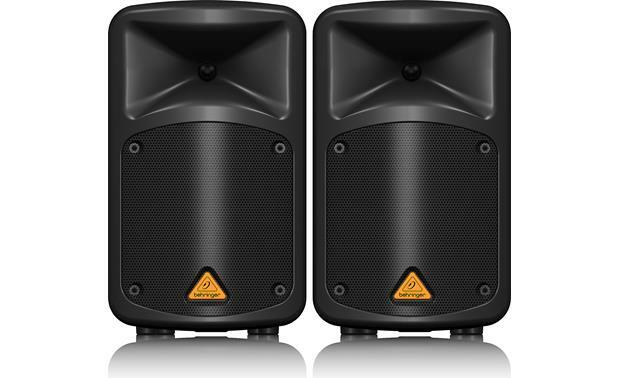 And with 500 Watts of stereo output, the EPS500MP3 has the power to deliver your message loud and clear. The detachable powered mixer offers 8-channel inputs; ranging from XLR mics, balanced & unbalanced 1/4" inputs, and stereo RCA inputs. 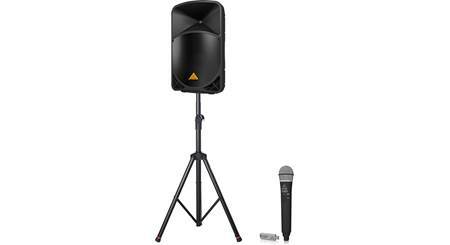 The PA system's powered mixer can be used either while installed in one of the speakers or detached for easy positioning and access. Inputs: The Behringer EPS500MP3 portable PA system offers a variety of inputs for greater flexibility. Channels 1-4: Channels 1-4 of the detachable powered mixer feature Behringer's high-quality XENYX Mic Preamps, which have been praised by audio professionals for their transparency and massive headroom. This means you get a truly clean input signal without any unwanted coloration or distortion. Channels 1-4 accept balanced XLR mics, as well as balanced and unbalanced 1/4" line-level sources, such as electronic keyboards. Channels 5/6 & 7/8: Stereo channels 5/6 and 7/8 accommodate RCA and 1/4" inputs, such as drum machines, keyboard, sound modules, etc..
USB Input: The EPS500MP3 features USB (type-A) input to plug in your USB thumbdrive for MP3 (8-320kbps; 8-48kHz) music playback. You can use the system's 4-button pad (Play/Pause, Random, Rewind, & Forward) to control music playback. 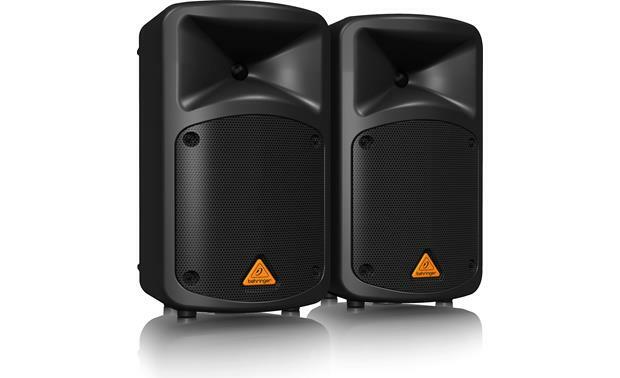 Speaker Outputs: The Behringer EPS500MP3 portable PA system features 1/4" outputs for connecting the included pair of two-way loudspeakers and for connecting a set of powered monitor speakers (sold separately). The included two-way loudspeaker's connect to the system's detachable powered mixer via the supplied 20' speaker cables. 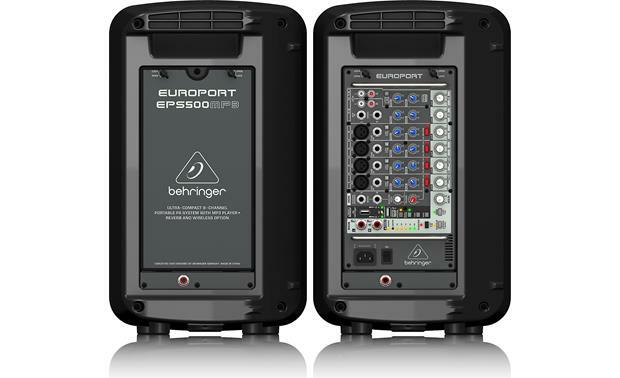 Controls: The Behringer EPS500MP3 portable PA system provides the controls you need to tailor the system to your application. Main Volume: The Main Volume level (0-10) adjusts the overall volume of the PA system's at its speaker outputs. Channel Level: You can adjust the volume level (0-10) of each channel input individually. 2-Band EQ: Each input channel has a highly musical 2-band EQ (Bass & Treble) that can be adjusted from -15 to +15dB. Reverb: Channels 1-4 include a great sounding digital Reverb processor to help with musical effects. Contour: Changes the frequency boost to optimize for speech or music. Voice-Over-Priority: The Voice-Over-Priority function automatically lowers the stereo channels when you're on the mic, so all of your important announcements will be heard. Phantom Power: You can engage the +48V phantom power feature for studio-quality condenser microphones. Included Microphone: The Behringer EPS500MP3 portable PA system comes with a dynamic vocal/instrument microphone for excellent studio and live performance. The mic offers an ultra-wide frequency response for brilliant and transparent sound. The mic's Cardioid design minimizes background noise and feedback. It comes with an spherical wind and pop noise filter, microphone clip and stand adapter, carrying case, and a 20' mic cable. UltraLink ULM Wireless Mic Compatible: The Behringer EPS500MP3 is compatible with Behringer's UltraLink digital wireless microphones (sold separately). The Behringer UltraLink digital wireless mic system is a high-performance 2.4GHz digital wireless microphone with USB receiver. 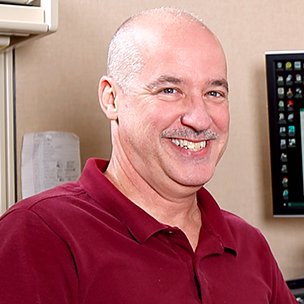 And because the wireless signal is digitally encrypted, your audio signal gets through in all its pristine, high-definition quality, without the random artifacts that often plague other wireless systems. Auto Limiter: The PA system's Auto limiter prevents overload damage to power amplifier and speakers. Mounting Options: The PA system's two-way loudspeakers can be placed on a flat table-top surface or mounted to stand (sold separately) via their integrated 35-mm pole socket. Storage Compartment: One of the two-way loudspeakers features a storage compartment that is used to store the microphone, cables, and accessories. Switching Power Supply: The Behringer EPS500MP3 uses a switching power supply for maximum flexibility, noise-free audio, superior transient response plus low power consumption for energy savings. Searches related to the Behringer EPS500MP3 Portable 8-channel PA system with built-in MP3 player.